Fox News has two very different programming entities: Straight news coverage via programs such as America’s Newsroom, Happening Now, The Real Story, and Shepard Smith Reporting; and opinion offerings like The O’Reilly Factor, Hannity, Outnumbered, and The Five. Usually Fox is wise enough to leave these two entities on separate islands when it comes to covering big events. You won’t see, for example, a Bill O’Reilly or Sean Hannity anchoring, say, election night coverage. Nor will you ever see Shepard Smith as a panelist on The Five. Since its inception, Fox runs itself like your average newspaper: There’s the hard news section and there’s the op-ed page — and the split is mostly even. Pew Research’s most recent study on the matter had Fox at a 54/46 opinion-to-straight-news-reporting split. MSNBC was an 85/15 split (in favor of opinion) while CNN was at 46/54. So it was interesting (at first) to see Smith interacting with the cast of The Five as riots in Baltimore began to really spin out of control Monday afternoon. 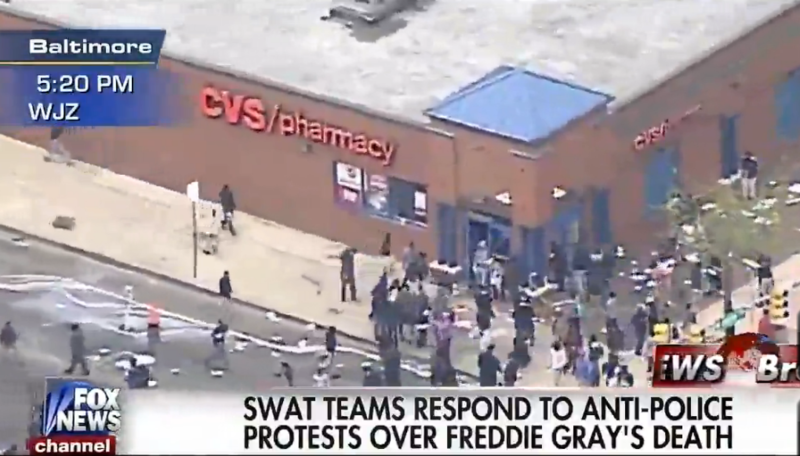 Like Ferguson, all the cable news networks rightly went all-in on Baltimore coverage…a no-brainer given this is a major American city and the visuals and chaos presented via local Baltimore affiliates (burning cars, rocks being hurled at police, stores being looted). At Fox, situations like this usually call for Smith’s “News Deck” to preempt all opinion programing in its wake. But the network instead opted to combine Smith with the unfiltered pundits of The Five, and the result was truly awkward. At first, Shep ran the show with little input from the cast. From there, it was — for lack of a better word — different to hear Stacey Dash or Kimberly Guilfoyle, who aren’t anchors, pose various questions about the situation to their primary news anchor. But after a few minutes, Smith seemingly became annoyed to be dragged into an opinion show, where perspective and punditry (mixed with a little speculation) is usually the standard recipe. Remember: Smith isn’t a pundit or politician, he’s an anchor who should have never been put into such a conversation with Bolling and Gutfeld, who were simply doing what they’re paid to do: Opinion. And opinion is something that has its time and place. Fox should have stuck with Shep and their reporter on the ground (Doug McKelway) and let the “News Deck” serve its purpose while giving The Five the afternoon off. Or…let the Five do their thing while tossing to Shep periodically with updates throughout the show. But by mixing Fox’s hard news page with it’s op-ed page, it did itself no favors in terms of informing its viewers while simultaneously waging an internal food fight between those with distinctively different roles for millions to be privy to.